Dr. Michael Warren and Chris Clarke with THA's Tennessee Center for Patient Safety promote the state's successful breastfeeding initiative. While he has certainly fulfilled his goal of serving others, it turns out 'the neighborhood' is located one state over and boasts a slightly larger population than the "500 or so" people in Newton Grove, N.C. In April, Warren was appointed deputy commissioner for Population Health for the Tennessee Department of Health. 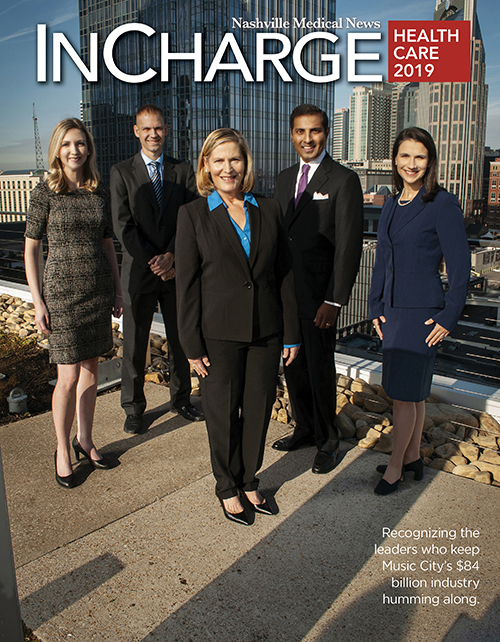 In his new role, Warren has oversight of a number of departments directly impacting the health and well-being of more than 6.5 million Tennesseans. Warren was raised in a tight-knit family on his great-grandfather's farm. "Growing up, I knew six of my eight great-grandparents," he said, adding that he didn't realize that was unusual until many years later. Early on, his parents instilled a strong work and service ethic in Warren and his brother. "I always knew I wanted to do something with kids. I went back and forth between pediatrics and early childhood education," he said. By the time he began his undergraduate studies at Wake Forest University, Warren had some clarity. "When I wen to Wake, I was pretty sure what I wanted to do ... not only did they have a good pre-med track, but they really value service there so that was important to me," he said. After graduation, Warren stayed in state for medical school at East Carolina University. When it was time for residency, Warren said he looked mostly in the Southeast. "I had never been to Nashville, but I had heard of Vanderbilt," he recalled. A visit to the academic medical center sealed the deal for Warren. Already, the young physician knew that he wanted to do more than just care for the next patient through the door ... he just didn't know exactly what that meant. "I knew there were things outside the exam room that impacted patients," he said. Visiting Vanderbilt gave him the strong sense that his training would also nurture that desire for advocacy. "There was a strong relationship - and continues to be so today - between the community pediatricians and the Children's Hospital," he said. "It really made Vanderbilt an easy choice when it came time for ranking, and I was fortunate to match here." The plan was still to finish residency and go home to North Carolina. However, Warren continued, "I was fortunate enough to be chosen as chief resident so that bought me another year." During that time, he actually embarked on a two-year fellowship that included a simultaneous master's degree in Public Health. During his fellowship, which required a 240-hour practicum, Warren had the opportunity work at a state level on issues surrounding infant mortality. "I ended up as a fellow splitting time between Vanderbilt and serving as medical director at the Governor's Office of Children's Care Coordination," Warren explained. "That, for me, is when everything sort of jelled - clinical, academic, and being able to do both at a population health level." When a director's position opened in late 2010 at the TDH to oversee maternal and child health initiatives, Warren said he had to reexamine his original life plan. "By that point, I had been here seven years, and I loved Nashville. The timing just felt right to stay here, and it's a decision I've never regretted." In just over a year, the board-certified pediatrician was approached by Commissioner John Dreyzehner, MD, MPH, FACOEM about the position of assistant commissioner for the Division of Family Health and Wellness. While flattered, Warren wondered if the job might be better suited to a physician focused on chronic disease in adult populations. Dreyzehner quickly disabused the notion. "He said, 'We want to think upstream about prevention of those diseases so I absolutely think a pediatrician is the right fit for that,'" Warren recalled with a grin. Under his leadership, the division flourished. It became clear that capacity building must take priority to ensure the state had the resources to tackle the 'big three plus one' - tobacco use, physical inactivity, obesity and substance abuse. "We grew that team from about 80 up to 105 when I left earlier this year and really grew in a thoughtful way," he said. One example was the addition of epidemiologists to the division. "There were zero epidemiologists working in maternal/child health. It became clear that we needed more data and info," he said, adding there are now eight dedicated to the division. "That example really ties into our emphasis on data-driven decisions and evidence-based programming and policy." Warren and the team saw significant traction in a number of key areas. He noted that in Tennessee almost all babies are born in hospitals. "Five years ago, about 66 percent of babies started breastfeeding in the hospital," he said, adding that figure is about 78 percent now. 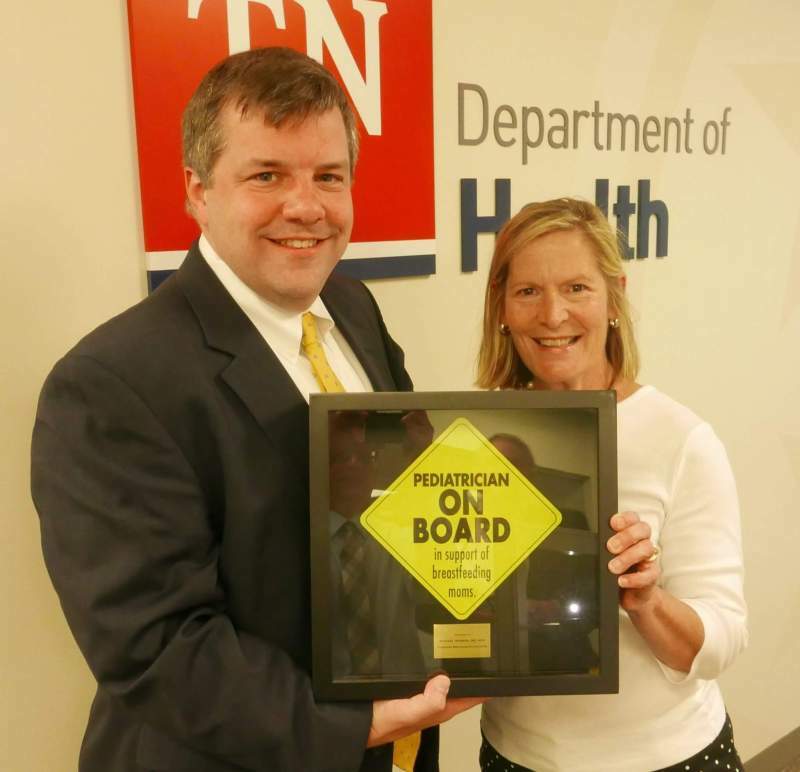 "One of the things you realize after you've done this job awhile is you can't do it alone," Warren continued, adding the 'On Board for Breastfeeding' campaign has been a collaborative effort with the Tennessee Hospital Association's Tennessee Center for Patient Safety and other community partners. Safe sleep has been another point of emphasis. With 34 teams across Tennessee really drilling down into infant mortality figures during the annual Child Fatality Review, it became clear that 20 percent of those deaths were due to unsafe sleep, which meant they were preventable. Tennessee implemented the 'ABC's' (alone, on the back, in a crib) of safe sleep in 2012. "That campaign got a shot in the arm in 2014 when we partnered with every birthing hospital in the state," Warren said. "All of them took a pledge to implement a safe sleep policy. People watch doctors and nurses. If you see someone put baby on his tummy at the hospital, you think that's okay." With the pledge, birthing hospitals share information on best practices for safe sleep and model that behavior, as well. 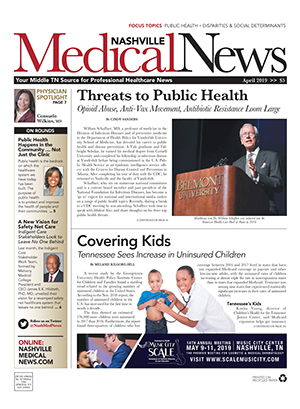 From 2012-2014, Tennessee has seen a 25 percent decline in sleep-related infant deaths. Again, Warren credits community collaborations with moving the needle. "I think it shows you what we can do as a state when we commit to working together." Now in his new role, Warren will continue to have oversight of Family Health and Wellness but will also provide leadership for a number of other offices and divisions within TDH including Policy, Planning and Assessment; Rural Health; Minority Health and Disparities Elimination; Health Planning; and Grants Coordination and Strategic Alignment. As with the entire TDH, Warren's priorities as deputy commissioner are focused on the 'big three plus one' ... which is now moving to the 'big four' as substance abuse has hit critical mass in the United States. "Those four topics are really the drivers of death and disability in Tennessee," Warren stated. More importantly, he continued, it makes sense to focus on those priorities from birth onward. "It's great that we can treat people when they're ill, but how can we keep them from getting that way in the first place?" he questioned. "We're really interested in how we move upstream with prevention." With so much on his plate, Warren readily admits work takes a lot of time and energy. "I feel fortunate, first of all, to work in a place that doesn't feel like I'm coming to 'work.' That said, it's important to have a balance." When he's off the clock, he makes it a priority to go home to North Carolina often to see his parents and brother. "I now have two nephews and a niece. I love to get away from the office and be Uncle Mike," he said. Back in Nashville, Warren said he's a big fan of the city's greenways and uses them often. He's also a big fan of the Nashville Predators and hopes to be part of a contingent of loyal followers who help cheer the team on to the Stanley Cup.